-Why do you need it? A bone graft for dental implant treatment may be necessary if your jawbone isn't thick enough in the spot where the implant needs to go. It is a well-established technique with a high success rate. Why would there be too little bone? First, the tooth may have been pulled some time ago, and the jaw bone has just shrunk down with time. Each year that goes by, the jaw bone shrinks a little more, although this process slows down over time. Second, infection. The most usual is the infection involved in gum disease. If you have gum disease around a tooth, the bone around that tooth shrinks down bit by bit, until the tooth gets loose, and you get it taken out. But taking the tooth out doesn't help the bone to grow back again. It stays shrunk! And even shrinks a little more as time goes by. As you can see, jawbone around teeth always tends to get less! It NEVER grows back! Nobody has been able to make jawbone grow back to its previous shape and size. So now you want to replace the missing tooth, and your dentist tells you that you need a bone graft for dental implant treatment to be successful. What does that mean? 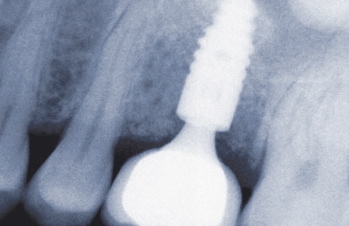 It means that your dentist will have to build up the bone in the spot where the implant needs to sit. We know that he can't make it grow back by magic. So what does he do? He adds some bone that he has taken from somewhere else. There are a few possibilities here. If he only needs a little additional bone, he can collect the tiny bone chippings from the hole he drills to put the implant in. Sometimes he can also add an artificial bone substitute to the chippings to gain a little extra bulk. But if he needs more bone than that, then he will have to take a small block of bone from somewhere else in your lower jaw, usually at the back where the wisdom teeth would be. Sometimes he may need to take a little bone from over the roots of your lower front teeth. It depends how much bone there might be available at the potential donor sites. The bone cavity that is left behind in these areas heals up and mostly grows back to almost the same shape as before. Of course, there is some pain in the "donor" area until it is healed. Rarely, the lower front teeth can be affected by the procedure also. They MAY become a little less firm, but this is unusual. The dentist then packs the bone graft chippings into the spot where the implant needs to go. Sometimes he has to do this first and let it heal for 6 months, before he puts the implant in there. Other times he can put the implant in straightaway and do the bone graft for the dental implant at the same time. While the area around your new bone graft is healing, (and also the donor area, if your dentist had to take a little bone from somewhere else in your mouth), it is vitally important that you keep dental plaque from building up. You have to keep everything really clean, otherwise infection can get in and interfere with the healing process. But you have to be very gentle, too, especially in the first few days after surgery. I have found the best solution is to use a sonic toothbrush with the highest possible frequency. This means than it feels more like a very gentle buzz on your gums, rather than the more coarse vibration that you get with a conventional electric toothbrush. 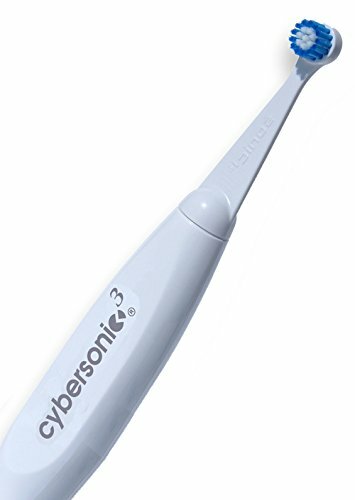 The toothbrush with the highest frequency is the Cybersonic 3. This will produce the best cleaning with the least vibration during the important healing phase of your implant treatment. To help prevent plaque building up, you should ALSO use both an oxygenating toothpaste and an oxygenating mouthwash; the BEST are from Thera Breath. The first one is TheraBreath Oxygenating Toothpaste. The SECOND one is a TheraBreath Oral Rinse.